Jefferson County Maasdam Barns – French-Reneker-Associates, Inc. 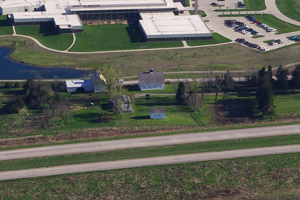 The Maasdam Barns are located at the intersection of Highway 34 and Highway 1 on the south side of Fairfield, Iowa, directly adjacent to the Jefferson County Health Center. The Maasdam farm was a prominent importer and breeder of draft horses. The buildings are equipped with Louden overhead, monorail hay carriers, which were first developed and manufactured in Fairfield. The Fairfield Loop Trail runs along the north and west sides of the historic farmstead. The Maasdam Barns were acquired as part of the right-of-way process by the Iowa Department of Transportation (DOT) to be used for the Highway 34 bypass around Fairfield. However, the Iowa DOT did not use the land directly occupied by the barns. Eventually, Jefferson County acquired the land from the Iowa DOT. The Maasdam Barns were placed on the National Register of Historic Places. The County desired to turn the Maasdam Barns into a historic site. In April 2008, an available house of similar age and character from downtown Fairfield was moved to the Maasdam Barns site to be developed as a Welcome Center for both the barns and the City of Fairfield. French-Reneker-Associates was engaged to prepare the project plans, specifications, bidding documents, funding applications, and assisted with construction-related engineering services. The project involved site work, remodeling of the house for the Welcome Center, and work on the barns. The site work included construction of a paved drive, sidewalk, and parking areas including parking for buses. The remodeling work included new public bathrooms and new electrical wiring for each of the three barns. The Show Barn work included foundation replacement and the construction of a cupola. The $324,000 project was funded by $210,000 in Iowa DOT Enhancement funds, a $90,000 Historical Site Preservation Grant from the State Historical Society of Iowa, and local donations.